Your job isn’t just about selling houses, it’s also about making connections with people, proving yourself to be a valuable source of knowledge, and establishing trust. If you’re using your social media networks as a megaphone for telling everyone about your new listings and open houses, you’re missing out on a big opportunity. 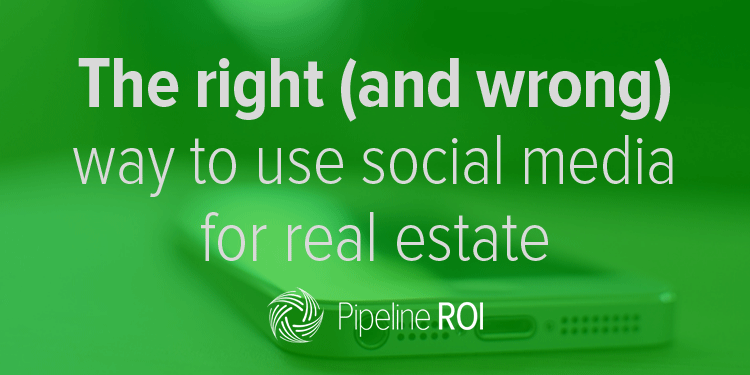 Here are some tips on what to do, and what not to do, when using social media for real estate. Don’t: Post a stream of new listings that only contain the MLS number and address. While you want to tell your followers about properties you’re looking to sell, you want to talk about it in a human voice. 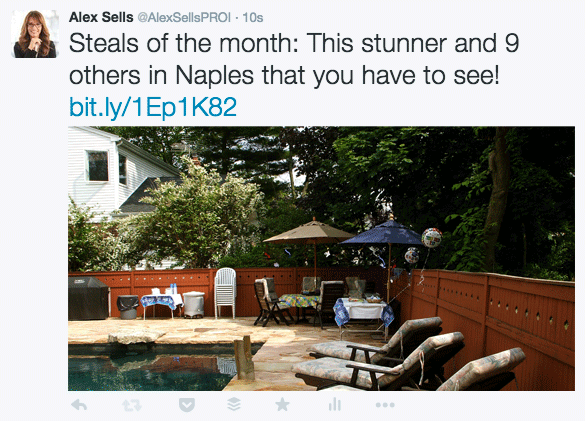 Have you ever seen a new listing Tweet that looks like the description was copied and pasted directly from the MLS? That’s what you want to avoid. Here’s a Tweet that’s likely to get skipped over by your followers. This type of post doesn’t provide any sort of value. It’s not eye-catching, and doesn’t make a potential buyer want to find out more about the property. Do: Mention new listings and open houses in a conversational manner. Social media is a visual, personal form of marketing. That’s why your followers aren’t likely to engage with a post that looks like it was generated by a computer. Though it takes a few extra seconds, it’s worth it to add a human description and an image to your social media posts about listings or open houses. This post is a lot more eye-catching than the one above. If you have a link to more information about the property, include that in your post as well. This way, if anyone is interested in seeing more pictures or finding out more, they know where to go. Don’t: Post anything too personal about your clients, or post without asking them first. Pictures of happy customers with keys in hand are great for your social media, but be sure and let them know ahead of time where you’ll be posting their pictures, and if it’s okay to tag them. No one likes a surprise tagged picture on Facebook. If you get your clients’ approval, a post like the one below is effective for putting real faces on your social media and showing you have happy clients. It should also go without saying (but I’ll say it just to be safe) that you shouldn’t post any personal information about your current or past clients, or their home buying or selling process. Even if your seller is being difficult one day or you find something funny in the living room of a home you’re touring, keep it off social media. You never know who will see your posts, and how they’ll take it. Do: Engage with past clients on social media. Look up your past clients who you had good working relationships with on Twitter, LinkedIn, or Pinterest. Steer clear of adding them on Facebook unless they send you a request. This can seem a little intrusive, since Facebook is sometimes seen as a more personal network. You can always ask them to like your Facebook page if you prefer to use that network for communication. 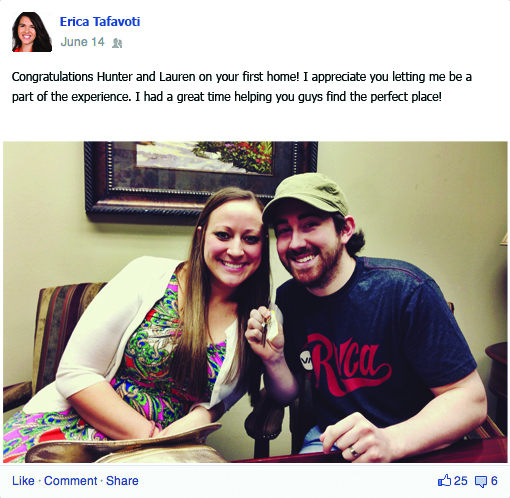 One way to share a client’s happy face more than once is to use app like Timehop to do a throwback to a client closing on or selling their home on the anniversary of their event. Don’t: Cram your feeds with links to your real estate website. If your only social media marketing goal is to direct all of your followers to your website, it’s going to be difficult to get anyone to like or follow your page. A diverse stream of real estate and local content is a lot more engaging than tons of links to listings on your website. You want to become the go-to source of information about your city and buying or selling a home. 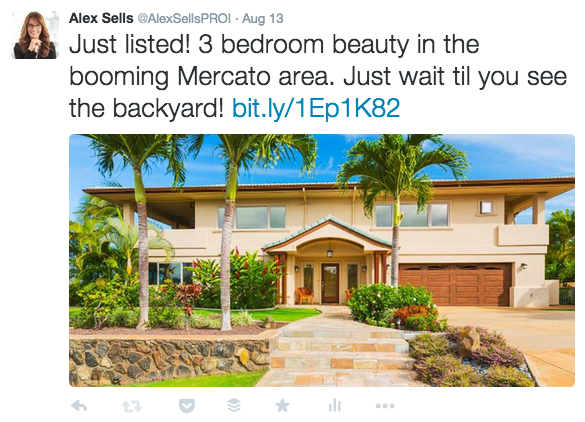 Here are 5 types of real estate content to share on social media. Use the 80/20 rule on social media. 80% of your posts should be valuable and informative or entertaining content about your area, the market, or home decor. The other 20% can be posts directly related to your business. Do: Link to landing pages on your website from your social networks. If you’re providing valuable content through your website, social media is a solid method for driving traffic to these pages. It’s smart to send your followers to website pages with lead capture. These could be content offers, blog posts, or any other page on your website with a lead capture form. You can even share the same update multiple times, with different text to accompany the link, like this. This allows you to re-purpose content on multiple days, which saves you time on your social media curating. Don’t: Share multiple posts in a short time frame. There may be certain times of the day that you spend on social media, but resist the urge to share dozens of posts in a row. There’s nothing more annoying (particularly on Twitter, where followers see everything you post) than your timeline being filled with a stream of posts in a row from the same account. That can make a person hit the unfollow button in a hurry. Do: Use a social scheduler to share consistently. If you only have time to spend on social media at night or on the weekends, that doesn’t mean you’re limited to posting at those times. A social scheduler can be your new best friend. These tools allow you to schedule out posts to your social networks ahead of time, which puts your sharing on autopilot. If you’re a Pipeline ROI customer, you have access to our built-in social media scheduler. If you aren’t, there are lots of other schedulers that are great options as well. Buffer and Hootsuite are the most popular.